This is the 2011 calendar!!! Hundreds of products, new and used. Dealers/ manufacturer's reps available, all in one convenient location. Unparalleled selection of RVs, boats and accessories all under one roof. Two shows for the price of one. Admission: $12 adults; $10 seniors (65+); children 16 & under; $8 parking. Check web sites listed above for the most up to date information. Formed over twenty years ago by four Chicago area siblings studying at the University of Rchester Eastman School of Music, the Ying Quartet is widely recognized as one of America's leading string quartets. Founding Ying family members Janet (violin), David (cello), and Phillip (viola) have now been joined by first violinist Frank Huang, winner of the 2003 Naumberg Violin Competition. The Yings were the first artists to be chosen for the National Endowment for the Arts' Rural Residencies Program. While they regularly perform in the leading world concert halls, they continue to follow their commitment to bring music to nontraditional venues and to support emerging young composers. They are the quartet-in-residence at the Eastman School of Music and have also been artists-in-residence at Harvard University, the Aspen Music Festival, and the Bowdoin International Music Festival. Livermore Knights of Columbus 38th annual Crab Feed. The Livermore Knights of Columbus will hold their 38th Annual Crab Feed on January 8th at the Robert Livermore Community Center. The event will feature an all you can eat crab dinner, raffles and prizes, and live music performed by Open Road. Doors open at 5 PM with dinner being served at 6 PM. This event is the premier event of the Livermore Knights. Proceeds from the dinner go to support the many charities and community groups that the Knights provide financial support and volunteer hours to. Last year the Knights contributed more than 46,000 volunteer hours to assist local groups and individuals. Admission: $40 per person, includes Salad, Pasta, lots of Crab, and Cake. LVPAC & KKIQ present Faith Alpher in the triumphant return of her funny and moving one woman show, Through the Eyes of Faith at the Bankhead Theatre on Sunday, January 9, 2011 at 2pm. Portraying over 20 characters including a Jewish Mother, Catholic Nun & a Black Hip Hop Dancer. This autobiographical journey will uplift & entertain you as it chronicles the life of a very funny & talented Jersey girl. You will be inspired through vulnerable stories of perseverance, race & love as they are mixed with song & dance to capture your heart & soul. Last year�s show sold out!! This is one show you don�t want to miss. For its first visit to Pleasanton, the Cypress Quartet, a young though well-established San Francisco ensemble, will perform Mozart�s K.465 (Dissonance), Schulhoff�s Five Pieces for String Quartet, and the Debussy Quartet. Their passion will draw you into the music while their energy will have you on the edge of your seat. Diavolo was founded in 1992 in Los Angeles by Jacques Heim to create large-scale interdisciplinary performances which examine the ways individuals act with their environment. The company is comprised of dancers, gymnasts and actors who create performances collaboratively under Heim's guidance. The sets are outrageous and surrealistic and form an intrinsic part of each piece of work. Everyday items such as doors, chairs and stairways provide the back-drop for dramatic movement-leaping, flying, twirling-that creates metaphors for the challenge of relationships, the absurdities of life and the struggle to maintain our humanity in an increasingly technological world. Greet the new year with a tribute to the unforgettable songs of The American Classic Songbook composers Rodgers & Hammerstein and Rodgers & Hart. Chelsea Nenni and Zachary Franczak, two of theater�s brightest upcoming stars, bring their humor,drama, sophistication and joy to center stage in an intimate revue featuring songs from The Sound of Music, The King and I, Oklahoma, Carousel, South Pacific, and more! Admission: $5.00 for Adults $8 parking. Please join us January 20, 2011, 7:00 pm at Sapphire in Livermore for a night of local fashion and fun, all while helping the The Taylor Family Foundation's kids. Each ticket includes glass of champagne and raffle. Silent auction, music by Amos Productions, performance by Livermore Dance, meet the burlesque troop of Original Sins. Fashion by Fairy Godmother Dress rentals, Up Town Girls and AlinaB. We're off to the Riviera with Broadway's smash-hit musical comedy, Dirty Rotten Scoundrels. This is the story of two very funny con men who try to out-con each other. When it becomes apparent that the Riviera isn't big enough for the both of them, they make a winner-take-all wager over the fortunes of a na�ve American soap heiress: the first one to "clean her out" can make the other clear out and keep the Riviera and its unsuspecting tourists to himself! This hysterical musical comedy will have you laughing and rolling in the aisles! Admission: Individual tickets: $37.50 for adults (18-60), $35.50 for seniors (60+), $27.50 for juniors (under 18). Season tickets (4 shows): $130 for adults (18-60), $123 for seniors (60+), $93 for juniors (under 18). Main Library This popular program, in which children read to dogs, will begin its new season this January. Paws to Read, a program sponsored by the Livermore Public Library and the Valley Humane Society, is based on studies which show that reading with trained therapy dogs can improve a child�s self-esteem and confidence, as well as encourage a child to read more. This program has proved to be very popular, with youngsters perfecting their reading skills. The Winter program series will take place on Wednesday evenings, January 19 through March 9, 2011,with two sessions between 7 and 8 p.m. Sessions will be approximately 25 minutes long and will be held in the Livermore Public Library Civic Center Storytime/Craft Room. Registration begins Monday, January 10th. Children may register for up to three sessions during the Winter series, as space allows. Drop-ins may be accepted on a first come, first served basis. Participating children should not be fearful of dogs or have allergies to pets. For more information or to register, please call the Livermore Public Library's Children's Desk at 925-373-5500, ext. 5504. Main Library A special Kick-Off Event for Livermore Reads Together � 1906: A Novel will take place from 2-4pm on Sunday, January 23, 2011 at the Livermore Public Library Civic Center, 1188 S. Livermore Avenue. James Dalessandro, author of 1906: A Novel, will be the featured speaker, and will also show his documentary film The Damnedest Finest Ruins, followed by refreshments and turn-of-the-century music provided by keyboardist Greg Pane. James Dalessandro was born in Cleveland, Ohio in 1948. While attending Ohio University, he watched a documentary about the Beat Poets, read Howl, and decided to hitchhike to California to make his name as the next Gary Snyder. Dalessandro was too late to become a Beat, but he did join Lawrence Ferlinghetti in co-founding the Santa Cruz Poetry Festival, a renowned annual literary event that attracted the likes of Charles Bukowski, William Burroughs, and Ken Kesey. Dalessandro also worked as a writer at Columbia Pictures, and he currently teaches screenwriting at Academy of Art University in San Francisco. He is the author of Canary in a Coal Mine (a volume of poetry), Bohemian Heart (a detective novel), and Citizen Jane: A True Story of Money, Murder, and One Woman�s Mission to Put a Killer Behind Bars (a true crime book). Keyboardist Greg Pane has played improvisation music for the silent film showings at The Niles Essanay Silent Film Theater and Museum for 5 years and grew up in Livermore playing music he mocked off the family player piano rolls starting at age 5. This program is part of Livermore Reads Together, a community-wide reading program featuring James Dalessandro�s book, 1906: A Novel, about the San Francisco earthquake and fire. 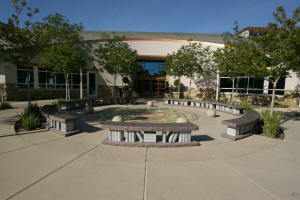 The community of Livermore is encouraged to join their neighbors by participating in the Livermore Reads Together free events for children and adults during the month of February 2011. Copies of books and event schedules are available at all Livermore Public Library locations. Livermore Reads Together is generously sponsored by The Friends of the Livermore Library.